One of the first things I did upon moving to New York City was to buy some books about this great metropolis: guide books, historical accounts, collections of stories from famous reporters. My excitement grew with each word I read. However, being unfamiliar with the streets and neighborhoods, all the colorful references to locations were just floating concepts. After reading, I didn't know my Chambers from my Schermerhorn streets, nor that my daily bike ride to work took me past Orson Welles' home on 14th St. So why not visualize places mentioned in books on a map? Now you can. 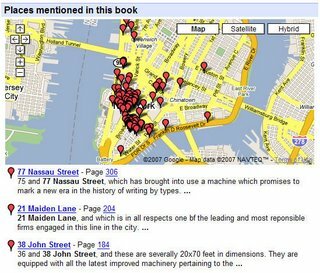 Our team has begun to animate the static information found in books by organizing a sample of locations from them on an interactive Google Map, with snippets of text from the book, and links to the actual pages where the locations are mentioned. 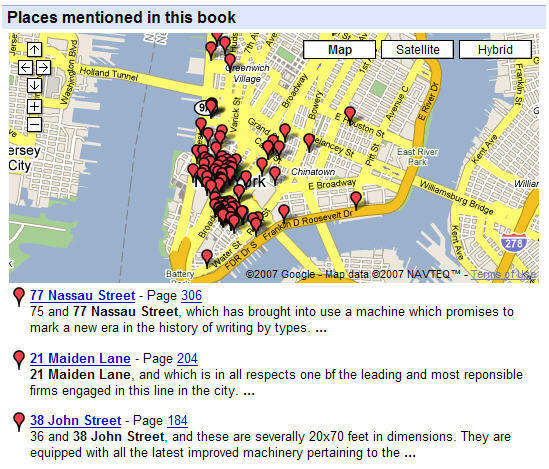 When our automatic techniques determine that there are a good number of quality locations from a book to show you, you'll find a map on the "About this book" page. I'm still exploring ever changing New York with everything from Illustrated New York (1888) – pictured above – to the modern day Rough Guide on the city. We hope this feature helps you plan your next trip, research an area for academic purposes, or visualize the haunts of your favorite fictional characters. Above all, have fun, and let us know what you think!